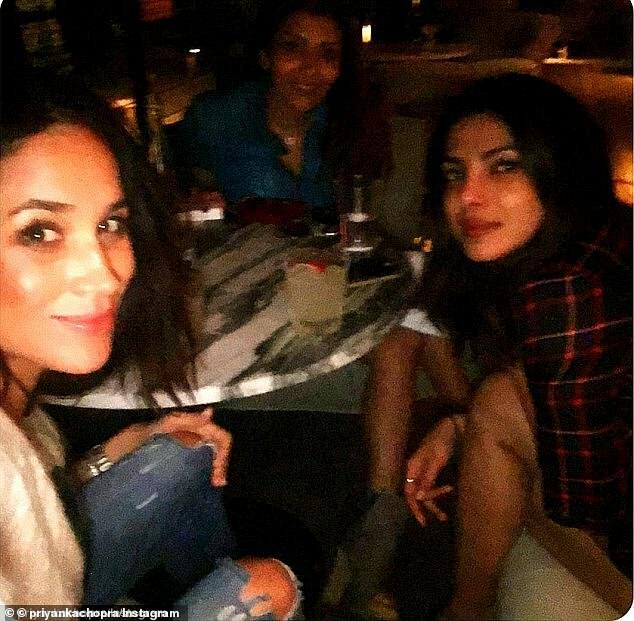 It came as a shock to royal watchers when Meghan‘s close pal Priyanka Chopra was absent from her baby shower last week. And now sources have claimed that the actress, 36, deliberately chose to skip the shower due to strains on the friendship. According to Page Six, Priyanka declined the invite after Meghan chose not to attend her wedding to Nick Jonas in December. A source told Page Six that ‘Priyanka was crushed’ and therefore skipped the $500,000 baby shower held for the royal at the Mark Hotel last week. However, the website also reports that a second source close to the former Miss World described the claims as ‘inaccurate and untrue’. MailOnline has contacted representatives of Priyanka for a comment. It was previously reported that Priyanka had been absent from her friend’s celebrations due to work commitments across the country in Los Angeles, according to TMZ. The actress had been busy attending meetings for a book she is writing, reports the website. Yet in spite of it all, sources have told TMZ the ladies still speak with each other on a regular basis, and their friendship hasn’t changed. The ladies first became friends after bonding at an Elle Women in Television event in January 2016. Meghan previously revealed they became friends easily. ‘You know when you meet someone and you just click?’ Meghan told the Press Trust Of India. The Duchess Of Sussex is expecting her first child with husband Prince Harry, which is expected to arrive at the end of April to early May. Her baby shower last week saw the likes of Serena Williams, Jessica Mulroney, Misha Nonoo, Abigail Spencer, and Amal Clooney in attendance. Daniel Martin, Meghan’s longtime friend and makeup artist, dished on the February 20 festivities in an interview with People. ‘It was exactly what she needed, and it was a reunion for all of us, too, who hadn’t seen each other since the wedding,’ he said.